"Sampath Speaking" - the thoughts of an Insurer from Thiruvallikkeni: Hurricane Irma struck St Maarten; looters took over stealing rare animals too !! Hurricane Irma struck St Maarten; looters took over stealing rare animals too !! Irma, was the first Category 5 hurricane to strike the Leeward Islands on record, followed by Hurricane Maria only two weeks later. The ninth named storm, fourth hurricane, and second major hurricane of the 2017 Atlantic hurricane season, Irma caused widespread and catastrophic damage throughout its long lifetime, particularly in parts of the northeastern Caribbean and the Florida Keys. Irma developed on August 30, 2017 near the Cape Verde Islands, from a tropical wave that had moved off the west African coast three days prior. Under favorable conditions, Irma rapidly intensified shortly after formation and on Sept 6, Irma reached its peak intensity with 185 mph (295 km/h) winds and a minimum pressure of 914 hPa (27.0 inHg), making it the second most intense tropical cyclone worldwide so far in 2017, behind only Hurricane Maria, and the strongest worldwide in 2017 in terms of wind speed. 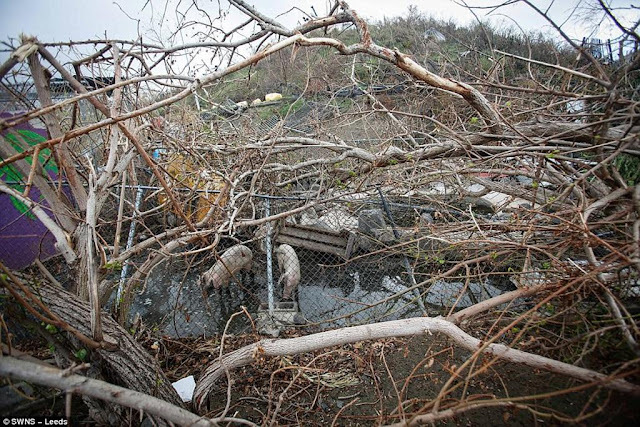 The storm caused catastrophic damage in Barbuda, Saint Barthélemy, Saint Martin, Anguilla, and the Virgin Islands as a Category 5 hurricane. In its trail it left behind human deaths, loss of property, displacement and more miseries .. .. ..
Keacy Uydess Carty, right handed middle order batsman, represents the Leeward Islands in West Indian domestic cricket. In U19 World cup finals in 2016, Carty scored 52 no against India and won the man of the match ! – he hails from St Martin. In 1493, during Christopher Columbus' second voyage to the West Indies, upon first sighting the island he named it Isla de San Martín ~ however, Columbus never landed there, and Spain made the settlement of the island a low priority. Sint Maarten is an island country in the Caribbean. It is a constituent country of the Kingdom of the Netherlands. In 1994, the Kingdom of the Netherlands and France signed the Franco-Dutch treaty on Saint Martin border controls, which allows for joint Franco-Dutch border controls on so-called "risk flights". In Oct 2010, Sint Maarten became a constituent country within the Kingdom of the Netherlands, making it a constitutional equal partner with Aruba, Curaçao, and the Netherlands proper. On 6 and 7 September 2017 the island was hit by Category 5 Hurricane Irma, which caused widespread and significant damage to buildings and infrastructure. It displaced people bringing in untold problems to its residents, turning the picturesque tourist haven into a sweltering trash heap without power, water or communications. What the hurricane didn’t steal, looters often did. It is not only the property of fellow-residents that greedy humans stole at the island, they stole dozens of rare animals too from one of the best-loved zoos in the Caribbean after Hurricane Irma destroyed cages and enclosures at the park on St Maarten. MailOnline reports of the tragic scenes in the island as Zoo Staff are fighting to rehouse and protect rare breeds at the site that was home to more than 300 animals before they escaped in the terrifying chaos of last week's 225mph winds. One rare lizard, a salamander called Big Lizard, one of the zoo’s star attractions, died of fright as the worst storm ever to hit the Atlantic lashed his enclosure last week. A well-loved toucan was also killed when it escaped its broken cage and was eaten by a caiman -- a ferocious type of crocodile -- which was lying submerged in a pond in its enclosure. The caiman also ate one of the rare rabbits. 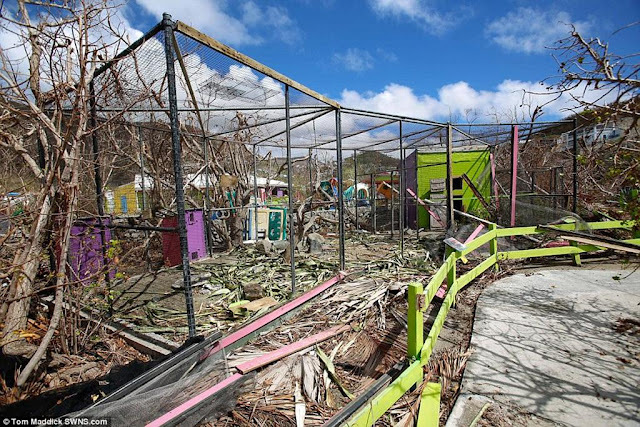 It adds that local people on St Maarten are now rushing to protect the exotic animals at the region’s largest zoo as dozens of rare breeds have been looted from the wreckage ! The elaborate zoological park opened in 1991 and was home to more than 300 animals. The zoo was greatly valued by locals who saw it as the pride of their island and was particularly popular with families but it has now been completely destroyed. Some monkeys escaped forcing a local to catch them -leaving one rescuer bitten on the hand ~ a number of cages hung open with their animals either escaped or stolen following the hurricane portraying a sordid tale. It is reported that about 100 animals have been taken into foster care by volunteers with experience looking after pets. 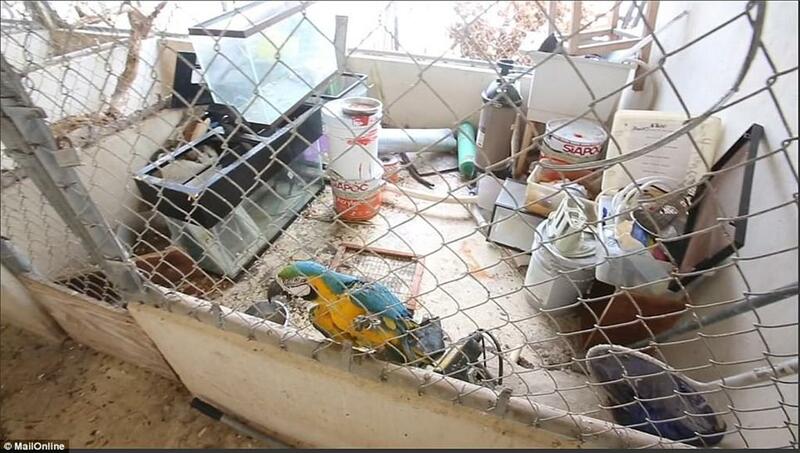 At least six animals have been confirmed stolen and staff at St Maarten Zoo are investigating the whereabouts of scores more. The shop and café inside the zoo had been ransacked by looters and the zoo car had been stolen ! Generally, rare animals are not of great value for outsiders as it is difficult feeding and protecting them ~ but they always have a great value in grey market and looters looking for some quick money would not care to foster them and animals could easily die in their hands .. .. .. sad !